With the debate over which Ranger seasons take place in what universe/dimension going on, I figured it was time somebody created something to help keep track of it all. Many hints over the decades suggest that there are countless teams of Power Rangers on different planets, in different galaxies, in different times, in different dimensions, in different universes. Any information regarding this would be helpful Ranger fans. Let's make sure there is a record to set the Rangerverses straight for all Ranger fans everyone. - The Power Rangers' battle between good and evil began when two astronauts unintentionally released the evil space sorceress Rita Repulsa from her confinement within a space dumpster on the moon. Since then, many more villains have made their way to Earth, been born on Earth, been accidentally released, or traveled trough time to certain time periods. There have been aliens, machines, demons, mutants, cyborgs, Orgs, ancient monsters, creatures from the underworld, cursed humans, beast monsters, Nighloks, and more. - There have been many Power Rangers in the universe prior to Earth getting its first team, the Mighty Morphin Power Rangers in 1993 (later the Wild West Rangers due to changes to the past). - After Power Rangers In Space defeated the United Alliance of Evi, Earth made unprecedented technological jumps that allowed them to construct the massive Terra Venture spacecraft, and to access the Morphin Grid, creating their own Power Rangers. - The villains, after the final battle, are mostly destroyed, some contained for good, and a few turned good (though some were destroyed after turning good). - All Power Rangers are connected to the Morphing Grid, no matter how they get their powers. - The first Evil Rangerverse was discovered by Ninja Storm when Tori was washed into an alternate dimension where the Ninja Storm Rangers are the evil villains, and Lothor's army are the good guys running the town. - This universe has been altered by time-travel 19+ times. - Though SPD fights the Troobian Empire and Broodwing in 2025, and Time Force Rangers are dealing with Ransik in the year 3000 prior to his time travel to 2001 (which would make him the final Power Rangers villain by chronological standards), by season and series logic, Power Rangers Megaforce/Super Megaforce is the last season to occur in the Primary Rangerverse, though they take place from early 2013 to late 2014. - The Venjix Virus is accidentally released, takes over the world's computers, builds an army of Grinders, and launches an attack that allows him to conquer all of Earth, minus Corinth City. This forces Dr. K to use Project R.A.N.G.E.R on a few select people to become Power Rangers RPM and defend the last human city on Earth from Venjix's machine army. - This dimension is an apocalyptic one due to machine takeover. - This universe's Rangers use unseen energy grid that Dr. K calls the "Bio-field" to morph and gain power. It is a universal bio-electric field that connects the life-force of all living things. The Bio-field, along with anything that is strongly connected to it (such as the RPM Rangers) can't be destroyed. It is believed that the Bio-field may be the Morphing Grid in this universe. - The Power Rangers RPM is believed to have fought from 2008 to 2009, but it may be further into the future. - The Venjix Virus may still be an active villain as Professor Cog and Grinders appear long after the Venjix Virus's final battle to conquer Corinth City. The Power Rangers' battle between good and evil, in this universe, began when Sledge the bounty hunter and his crew came to Earth, hoping to take the 10 Energems. 65 millions years ago, Sledge's pursuit of the Keeper of the Energems led to the Energems being on Earth, allowing 10 individuals to bond to the Energems and become Power Rangers Dino Charge. - There have been many Power Rangers in the universe prior to the Earth getting its first team, Power Rangers Dino Charge. When Dino Charge travels back in time 65 million years, Sledge recognized them as Power Rangers. This indicates that there have been Power Rangers for an incredibly long time. - This universe has been altered by time travel 2 times. - a prison dimension used by Rita and Lord Zedd. - A dimension where . - This is where Tommy fought TurbanShell and Lord Zedd worked to create his Dark Rangers. - An afterlife world for demons and demon monsters. - An afterlife world specifically for Orgs. -An alternate dimension where Power Rangers Ninja Storm are the villains attacking Blue Bay Harbor while Lothor is a good guy and the mayor of the city, assisted by Zurgane, Choobo, Motodrone, Vexacus, Shimazu, while Marah and Kapri and hippies. - An underground afterlife where an evil being, human or otherwise, goes where they are destroyed near it (anywhere in the entire city of Blue Bay Harbor). - A dimension where there's magic everywhere and mythical creatures exist. - An afterlife-like dimension for multiple types of monsters. - An evil dimension dominated by the Sanzu River, home to the Nighloks. - A dimension ruled by Lord Draven, which served as the location for the creation of Draven's evil Ranger army. 1. Rita Repulsa used the Ghost of Darkness to summon the Wizard of Deception to send somebody (it's unknown who) back in time. It's unknown how the time-stream was affected by this. 2. In season 2 of Mighty Morphin Power Rangers, the Wizard of Deception's magic wand was capable of sending people back in time. He sent the five-man Mighty Morphin Power Ranger team to colonial Angel Grove, turning a trio of rats into monsters to deal with them. Tommy Oliver took his wand and traveled to the past along with his clone Tom Oliver. After rescuing the other Rangers, Tommy returned to the present with his team while Tom stayed in the past. 3. In season 2 of Mighty Morphin Power Rangers, a Wormhole caused Kimberly and Goldar, Needlenose and the Z-Putties to travel from 1995 to 1880. This caused the creation of the Wild West Power Rangers in 1880, making them Earth's first team of Power Rangers instead of the Mighty Morphin Power Rangers. 4. In season 3 of Mighty Morphin Power Rangers, the Rangers sent the Zeo Crystal's five sub-crystals through time to different locations in different time periods. The crystals became part of legends and they affected the areas in which they were placed and the people that learned about them (even without knowing the sub-crystals' true nature. It's unknown how the time-stream was affected by this, aside from giving some people relief, ). 6. In Mighty Morphin Alien Rangers, Aisha gives her Zeo Crystal to Tanya to replace her as a Ranger. Aisha had decided to stay in the past to help the sick and aggressive animals. Aside from Aisha's family's history being altered so that they never leave Africa, and Tanya becoming a Power Ranger while being a child in an adult body, It's unknown how the time-stream was affected by this. 7. In Power Rangers Zeo, Prince Gasket trapped the people of Earth in a time loop, forcing them to relive the same day over and over so that he could observe the best way to attack them. 8. In Power Rangers Turbo, the Blue Senturion traveled back in time to warn the Turbo Rangers that the United Alliance of Evil would conquer the universe and divide it up amongst themselves in the year 2000. This gives the Rangers knowledge of what's to come and it gave them a fighting chance. Eventually, the United Alliance of Evil would be wiped out by the Zordon Wave, preventing the conquering of the Universe and allowing future teams of Power Rangers to exist. 9. In Power Rangers Lightspeed Rescue, through unknown means, Carter Grayson was able to return one day into the past to stop the other Power Rangers from being destroyed. This allowed the Lightspeed Rangers to live long enough to defeat Queen Bansheera and her demons and allow the world to have a future. 10. In Power Rangers Time Force, Ransik travels from the year 3000 to the year 2001 with four Time Force Officers in pursuit. This caused a long list of changes to the timeline. 1: Time Force Rangers first appear in 2001 at the same time Power Rangers Wild Force began forming. 11. In Power Rangers Time Force, it was revealed that Time Force's first experiments in time-travel caused their Quantumsaurus Rex to be sent back to the time of the dinosaurs while its control box was sent to a time long after the dinosaurs' extinction. Eventually the control box was found and Eric used it to become Quantum Ranger. Soon after, Quantum Ranger and Red Time Force Ranger went back in time to the age of dinosaurs to retrieve the Q-Rex. When the Q-Rex was to the age of the dinosaurs, it seems that time wasn't affected significantly while the control box made Eric the Quantum Ranger. Eric and Wes traveling back in time to retrieve the Q-Rex, which prevented it from being destroyed with the rest of the dinosaurs. Once the Q-Rex was brought to 2001, it gave the Rangers an added advantage against Ransik and his mutant gang and ultimately was both what nearly destroyed the world and what helped save the world in the Time Force Rangers' final battle. 12. In Power Rangers Wild Force, the Mut-Orgs (Orgs with mutant DNA) travels from the year 3001 to 2002 to team up with Master Org to conquer the world. Four of the Time Force Rangers, along with Ransik and Nadira went after them. This caused a team-up that allowed the Time Force Rangers and Wild Force Rangers to meet. This would have affected their familiarity during the Forever Red episode since Cole would not have known Wes and Eric then had the Mut-Orgs not traveled back in time. 13. In Power Rangers Ninja Storm, Cam used the Scroll of Time to travel into the past and retrieve the Samurai Amulet from his mother, Miko Watanabe. This altered Lothor's origins, allowed the Samurai Amulet to be used by Ninja Storm, and prevented a future where the Ninja Storm Rangers were destroyed from ever happening. 14. In Power Rangers SPD, Emperor Gruumm uses a time portal was to summon Katana, an alien samurai from feudal Kyoto, Japan, to 2025. It's unknown how the time-stream was affected by this or if it was affected at all. 15. In Power Rangers SPD, in one future, the Troobian Empire succeeds in destroying the SPD Rangers and Space Patrol Delta, which allows them to conquer Earth with ease. Many years after that, a division of Space Patrol Delta in the future has gained the technology of time travel, but it is rather limited in only sending across an officer and reducing them to a ball of light outside the usage of their SPD powers. This was the means by which Sam, the Omega Ranger, travels back in time, and assists SPD in their fight against the Troobian Empire. This prevented Space Patrol Delta and its Rangers from being destroyed, allows the Rangers to survive many battles afterward long enough to defeat the Troobians for good, and gave the Earth a better future. 16. In Power Rangers SPD, Broodwing used the Dino Gems to transport the three-main Dino Thunder Rangers from the time of their High School reunion to 2025. After the team-up battle, the Dino Thunder Rangers back to the moment in time they were pulled from, with their memories of 2025 erased. Due to the memory erasure, no knowledge of the future was brought back to the past and therefore, the timeline was not affected in any way. 17. In Power Rangers SPD, Emperor Gruumm passed his Terror Spacecraft through a wormhole to travel from 2025 to 2004 to conquer Earth without interference from SPD. Learning of this, the SPD Rangers followed through the wormhole to team-up with the Dino Rangers against the Troobians. All the Dino Thunder Rangers, except Tommy Oliver, underwent memory erasure. Only Tommy Oliver and his enemy Zeltrax retain information about the future. It is unknown how anyone else who saw Gruumm's Terror Spacecraft or any of his monsters and footsoldier were affected by this event. With all this said, it's unknown how the time-stream was affected by this. 18. In Power Rangers Operation Overdrive, Bridge Carson, now the Red SPD Ranger, came to 2007 as one of five Retro Rangers summoned by Sentinel Knight to replace and later fight alongside the Overdrive Rangers against Thrax. It's unknown how the time-stream was affected by this, aside from guaranteeing victory for the Overdrive Rangers during the team-up. 19. In Power Rangers Super Megaforce, Time Force sent the new Q-Rex Zord from the year 3015 back to 2014 to serve as the Silver Megaforce Ranger's Zord and Megazord. The Silver Ranger called it back through time whenever he needed to engage in a Megazord battle against giant monsters. 20 In Power Rangers Ninja Steel, the Ninja Steel Rangers final attack to destroy Galvanax caused the Ninja Nexus Prism to be fried, which caused the Ninja Steel Rangers' Ninja Power Stars, weapons and zords to turn to dust. Some time later, a monster related to a Galaxy Warrior attacked the powerless Rangers. Sarah got the monster's time controller and used it to travel into the past to retrieve the Ninja Power Stars from the Rangers' past selves while they're alone (to minimize time alterations) so that she can bring them to the present and use them to fight the monster. She transported herself to five different time periods during the Ninja Steel Rangers' battles with Galvanax. After defeating the monster, Sarah time-traveled again to put the Ninja Power Stars back where they came from and ensured that the timeline was completely unaffected, allowing it to progress as it originally happened. The timeline would've been affected had Sarah not gone back and put things back the way they were. With that, it's safe to say that the timeline has not been changed. The only changes to the time would be present Sarah's presence in the past, which were unnoticed. 1. In Power Rangers Dino SuperCharge, when Sledge started pulling the Earth out of orbit so he could freeze everyone on Earth and pry the 10 Energems and the Dark Energem from the Rangers' hands with ease. The Rangers destroyed the Dark Energem to unlock the Energem's full power. The Dark Energem's explosion created a black wormhole that swallowed up Sledge's ship with crew onboard (sending him to an alternate universe) and the Earth with billions of people on it (destroying it and them all). To save the Earth, all 10 Energems were used to create a time portal to transport the 10 Rangers 65 million years in the past to destroy Sledge long before he can make his return and cause the adventures leading up to Earth's destruction. 2. In Power Rangers Dino SuperCharge, after the Dino Charge Rangers destroy Sledge and his crew in the past, Keeper send Zenowing and Heckyl through time again to prevent Lord Arcanon from stealing the Dark Energem and destroying Sentai 6. Zenowing and Heckyl most likely destroyed Lord Arcanon and Singe. By destroying Lord Arcanon and Singe, Zenowing and Heckyl prevent Snide and Doomwing from being created (though their essences remain), prevent Sentai 6 from being destroyed and gives the planet a future, prevent Earth's encounter with Arcanon's forces while ensuring the planet's future after the Dino Charge Rangers' changes to the past, and changed many other events throughout the 65 million years (such as: preventing other planets form being attacked and/or destroyed by Lord Arcanon or Heckyl & Snide, Heckyl being the keeper of the Dark Energem and keeping it safe from evil). Zenowing and Heckyl are protected from changes to the timeline because they were both affected by the Energems). "Power Rangers - final battles"
"Power Rangers - Villains that actually destroyed Power Rangers or caused their demise"
Power Rangers sure has many worlds. I never realized so many things until I started making this. Several things to think about here with Super Ninja Steel's premiere. 1. Since the Dark Energem's Black Wormhole sent Dino Charge's timeline #1's Sledge and his crew to an alternate Earth, could it be possible that there's a way to travel back to timeline #1 where the Earth was destroyed despite a timeline #2 and #3 being created in its place? 2. Which dimension did Sledge and his crew get sent to? Primary Rangerverse or a Fourth Rangerverse? It would tell us where Ninja Steel exists and maybe tell us if the Ranger series will take place in the same Rangerverse we've known for decades or new one(s). It seems that we may have been given a hint as to which universe Ninja Steel live in not too long before Madame Odius took over Galvanax's ship and resources. 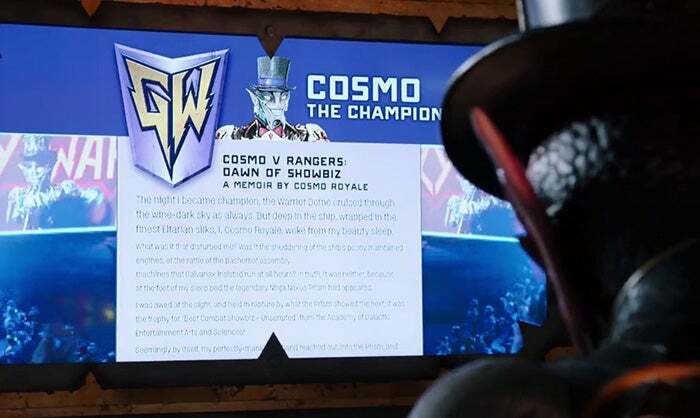 Remember when Cosmo Royale was making blog about how "great" he is at "running the Warrior Dome"? There were a few easter eggs in his blog page, one of them familir to Ranger fans since the Zordon era. This piece of info may be that the Ninja Steel Rangers are fighting in the same universe as MMPR-PRJF and PRS/PRSS-PRM/PRSM, unless this is an alternate dimension Eltar. We have seen alternate dimensions that had same-name places before.